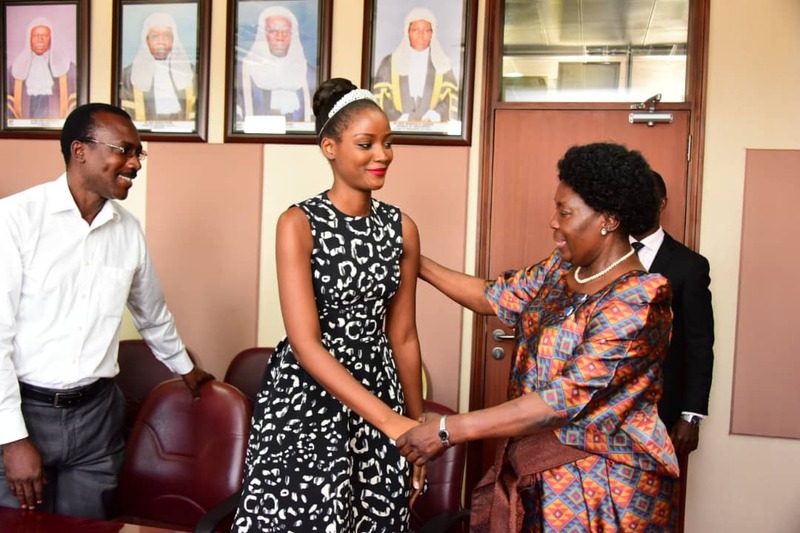 PARLIAMENT – The Speaker of Parliament, Rebecca Kadaga has pledged support to Miss World Africa and Uganda Quiin Abenakyo in her programmes to empower the girl child. Speaker said that it’s her commitment to support Abenakyo in her plans to succeed as miss Uganda and miss Africa. “This is the time to implement your plans as miss Uganda and also visit schools and other learning institutions in order to give moral support to students and encourage them to study hard,” she said. She added that this being the first time to get such a high profile in the miss world contests, Abenakyo needs to make a mark while doing her work. Abenakyo said she will put emphasis on fighting teenage pregnancies and keeping the girl child in school. On the Miss World programme, Abenakyo said she will visit different continents starting March to see how her colleagues are implementing their programs. The model is the first Miss Uganda to reach the top five of an international beauty pageant. She was also the only African to make it to the top five. In her presentation, Abenakyo fronted the use of food as a mean of bringing together girls to find solutions to the high levels of teenage pregnancies in the eastern part of Uganda. According to Uganda Demographic Health Survey (UDHS) 2016, 25 percent of adolescents aged 15-19 have begun childbearing while 19 percent of women aged 15-19, have already given birth. Prior to the coronation night, 14 candidates secured their spots in the Top 30. They were the winners of the fast-track events and the head-to-head challenge ne of the winners of the Head-to-Head challenge was Abenakyo. At this point, she had already made history as the first Miss Uganda to reach Top 30 in Miss World. With the new format, the Top 30 of Miss World were grouped into five continental groups namely Africa, America, Asia and Oceania, Caribbean and Europe. Two or three candidates from each group were selected to advance to the Top 12. From Africa, Abenakyo and Murielle Ravina of Mauritius made it to the Top 12. Between the two, the Ugandan representative was crowned Miss World Africa 2018, which qualified her to the top five. Joining Abenakyo in the top five were Miss World America 2018 Vanessa Ponce of Mexico, Miss Asia and Oceania 2018 Nicolene Limsnukan of Thailand, Miss World Caribbean Kadijah Robinson of Jamaica and Miss World Europe Maria Vasilevich of Belarus. Based on the public vote, Abenakyo ranked third while Ponce and Limsnukan ranked second and first, respectively. On August 10, this year Abenakyo was also crowned Miss Uganda 2018 at Sheraton Kampala Hotel in Kampala after edging 21 other contestants. Born in Kampala, Abenakyo is a student at Makerere University Business School and is set to graduate with a bachelor’s degree in Business Computing in January 2019. The Ministry of Tourism is planned a big welcome Abenakyo, who returned to the country after a stunning performance at the 68th Miss World contest in China. On returning to Uganda, aboard an Emirates business-class flight, Abenakyo received honourably by the state Minister for Tourism Godfrey Kiwanda Ssuubi and the sizable family members and friends before she was hosted by President Yoweri Kaguta Museveni at State House, Entebbe. Reports show that Abenakyo will be given a new role in the tourism sector. “I congratulate our muzukulu on these accolades and also salute her for recently completing her university degree course. She is a true definition of beauty coupled with brains,” said President Museveni. Abenakyo said she is not planning to abandon her ‘Beauty with Purpose’ project because of her Miss World Africa Crown. The reigning Miss Uganda, during a press briefing on December 21 in Kampala said fighting for a girl child is something that goes beyond her duties as a beauty queen but is also a personal drive. “Miss Uganda Foundation gave me a platform that I can use to reach out to our sisters who lost hope in life and I am looking forward to extending a hand in every way I can. And although my reign as Miss Uganda ends after one year, my project will keep running,” she said. “My objective is to put into action my project using the opportunity given to me by the Miss Uganda Foundation and Miss World Organisation to bring to the forefront of the world stage causes that promote the sanity of human life especially the girl child to fight teenage pregnancies,” said Abenakyo. She added that one in four adolescent girls between 14 to 19 either have a child or pregnant. This has led to school dropouts, health complications like fistula, some girls are banished from home leaving them helpless. This project moved all three Miss World judges thus voting her to the top 30 contestants after defeating Miss Argentina. Abenakyo also used this chance to advise young girls to chose right role models for their better future. “It’s not so right to have a role model like Oprah, Rihana and other common celebrities because people chose to show their best sides while on camera, but people close to us always make good role models because we always know their stories,” she said.